Sophisticated yet not fussy — and made to last: Mabo’s kids clothing line contains timeless pieces crafted for longevity, with an appreciation of elegant yet comfortable style. Although Mabo’s pieces have a European (read: effortlessly chic) feel about them, they were all designed and manufactured in the USA using natural fabrics like cotton and linen for summer and cozy corduroy and wool for cooler months. Favoring traditional designs such as A-line and smock-style dresses, blouses with Peter Pan collars, and playsuits, Mabo’s current collection manages to make styles from days past look current and cute with inviting patterns, color combinations, and details. We’re especially crushing on the Annie pinafore (above) and the Gemma dresses. They look cozy and comfy enough for everyday wear but are also easily fancied up with tights or leggings. 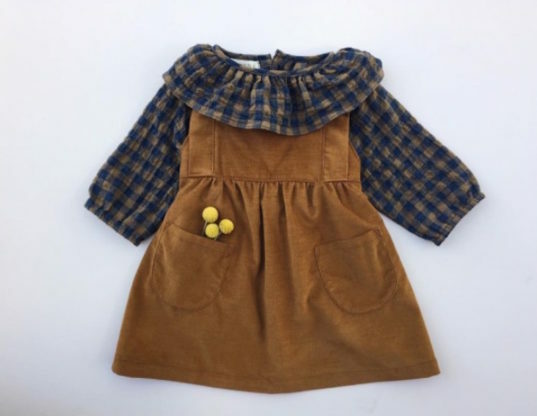 Mabo specifically cut the armholes for the Gemma dress with extensive wear in mind: as your little one grows the dress can become a tunic to be paired with bloomers or tights, and eventually a blouse. Mabo’s unisex pants make them a purchase that keeps on giving for future wearers. Mabo also has an extensive 100% organic cotton basics collection that’s ethically made in the U.S. using low-impact dyes. Tees, leggings, bonnets, and pajamas in solids or stripes (with a few polka dot options) make perfect and easy baby shower gifts that are extremely versatile whether worn alone or layered during the winter. Sophisticated yet not fussy -- and made to last: Mabo's kids clothing line contains timeless pieces crafted for longevity, with an appreciation of elegant yet comfortable style. Although Mabo's pieces have a European (read: effortlessly chic) feel about them, they were all designed and manufactured in the USA using natural fabrics like cotton and linen for summer and cozy corduroy and wool for cooler months. Favoring traditional designs such as A-line and smock-style dresses, blouses with Peter Pan collars, and playsuits, Mabo's current collection manages to make styles from days past look current and cute with inviting patterns, color combinations, and details.